The objective is to study the effect of Silicon Carbide (SiC) and Garnet of each 80 mesh size when used as abrasives while on machining LaPO4 + 20%Y2O3 composite in Abrasive Waterjet Machining (AWJM). The output responses, namely, Material Removal Rate (MRR), Kerf Angle (KA) and Surface Roughness (Ra) are measured with varied input parameters of Jet Pressure (JP), Stand-Off Distance (SOD), and Traverse Speed (TS). MRR and KA are found to be high in Garnet and better Ra in SiC. Microscopy examination on kerf surface reveals that failure is due to the development of internal stress and repetitive cyclic load of hard SiC abrasive. It leads to grain boundary and plastic deformation. Machining using Garnet tends to crush and squeeze the composite that guides to the formation of microcrack and weak grain bond. This study reveals that the use of SiC abrasive gives an acceptable range of output response than Garnet. 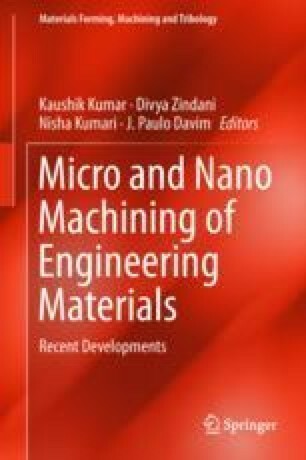 The authors wish to express their thanks to DST-FIST Sponsored Advance Machining and Measurement Laboratory-Kalasalingam University for their support rendered to pursue this research work.